National Library of Medicine traveling exhibitions are hosted throughout the United States and across the world. The host libraries, museums, and organizations plan and present enriching and engaging programs to connect their communities with the information in the exhibition and the wide-variety of NLM resources available to the public. This is the first post in a series called “Making Exhibition Connections,” which invites host venues to share their partnerships, programs, and public engagement experiences with Circulating Now readers. 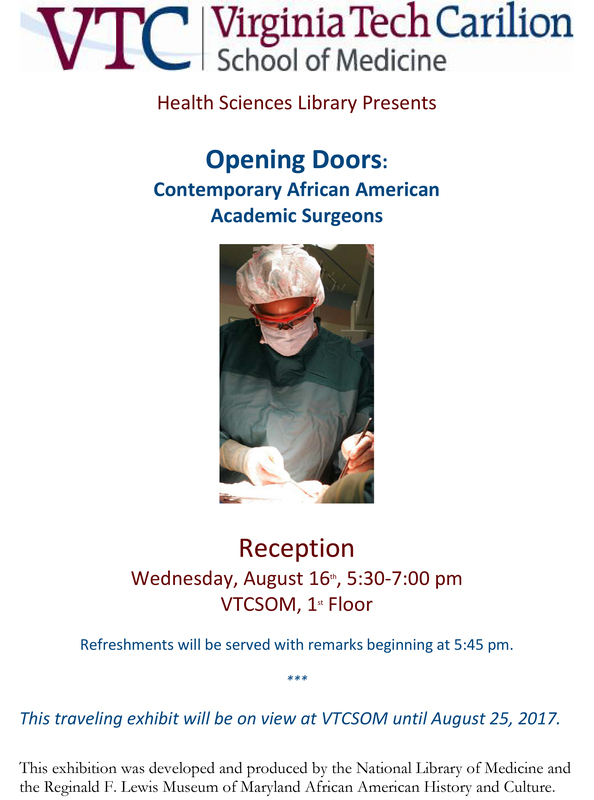 Today Rita McCandless, Head Librarian for the Virginia Tech Carilion School of Medicine Health Sciences Library in Roanoke, Virginia, talks about hosting Opening Doors: Contemporary African American Academic Surgeons. Circulating Now: Please tell us about Virginia Tech Carilion School of Medicine, including where the school is located. What National Library of Medicine traveling exhibition did you host and when did you host it? Rita Mccandless: The Virginia Tech Carilion School of Medicine is located in the beautiful city of Roanoke, Virginia, nestled at the base of the Appalachian and Blue Ridge Mountains. We are a new school with 42 students per class. We opened our doors to our charter class in 2010 and have graduated 5 classes with 100% residency match for all graduates. We hosted the Opening Doors: Contemporary African American Academic Surgeons traveling exhibit from July 19 through August 25, 2017. CN: Why did you want to host this exhibition? RM: The Virginia Tech Carilion School of Medicine champions the right of all members of our community to be valued and respected. We actively promote a culture of inclusiveness and mutual respect within our doors and throughout the community we serve. The school received national recognition when awarded the 2016 Health Professions Higher Education Excellence in Diversity award from INSIGHT into Diversity magazine. When a number of our students and faculty shared with me their experiences of being subjected to hate speech, I felt strongly that we should work within our community to communicate our strong belief in assuring that all of our members feel safe, respected, and welcome. Hosting the Opening Doors exhibit was one way to show our support. 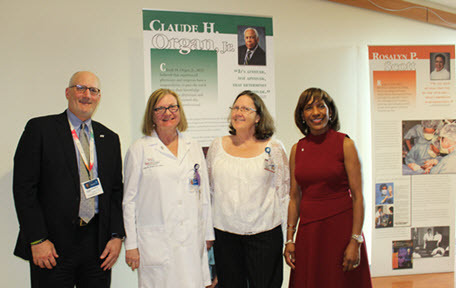 We also felt this exhibit would show our students how an individual has the power to shape the future and hope that it will inspire them to lead their generation as physician thought leaders. CN: How did you reach out to your community about the exhibition? What programs were planned to coincide with the exhibition? RM: Through press announcements, campus-wide email, and our relations with civic and local government leaders: we held a reception with guest speakers that included Michael Nussbaum, M.D., Chair of the Surgery Department, Dean Cynda Johnson, and our Chief Diversity Officer, Karen Eley Sanders, EdD. CN: What impact did the exhibition have on your community? RM: August 11 and 12, 2017, saw turmoil and violence in nearby Charlottesville, VA, and in our sister school, University of Virginia. This made the hosting of this exhibit especially poignant. To see burning torches, hear racial epithets, and witness hateful behavior in 2017 on an American campus was truly nightmarish for many of us, and the events raised grave concerns about the well-being of our community. Many community members touched the images and some wept as they read of the struggles and hardships endured by these early African-American pioneer surgeons. These pioneers are great men and women—it is important to see and know that someone that looks like you can become a surgeon. Our invited high school students were eager to talk to our medical faculty and students. CN: Do you think you were successful in connecting the exhibition topic with your community and why? The exhibition connected with our community. At the reception, I was still talking to some of our guests half an hour after the announced end time. These guests walked through the exhibit several times, some reading the accomplishments aloud to a family member. 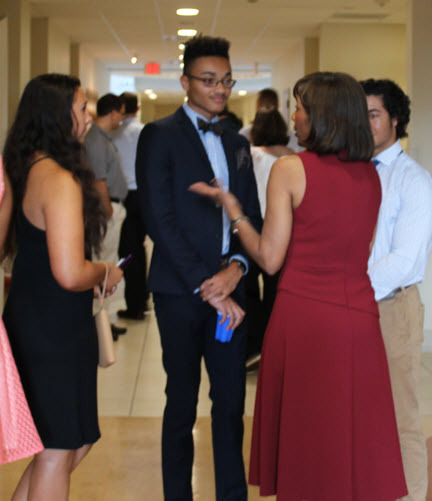 Some of our invited high school students have returned for other events and are participating in our community outreach programs, Within Reach and Mentors in Medicine. Rita McCandless is the Head Librarian for the Virginia Tech Carilion School of Medicine Health Sciences Library in Roanoke, Virginia. She specializes in research skills training for students and faculty, learner-centered pedagogy, and collection development. Rita is a member of the VTCSOM Council for Diversity & Inclusion, the Medical Library Association, and the International Association of Medical Science Educators. She just completed the AAMC’s Medical Education Research Certificate (MERC) program. Articles published are Implementing the Flipped Classroom (2014) and Simple Marketing Techniques and Space Planning to Increase Circulation (2011). To learn more about the library’s community outreach programs, visit http://medicine.vtc.vt.edu/community_outreach/.